WET hopes to be the best of Tarantino, of John Woo: All Crazy 88s, bullet ballets, death in a tight leather suit that flips and spins as she tears through screen after screen of enemies. But the acrobatic shooter dances, sword slicing, guns blazing, on the razor's edge of sheer spectacle, dangerously close to being a game that is perhaps all about style while offering little substance. It is certainly too soon to decide if playing fixer Rubi will offer gamers enough to be viewed as mere gimmick, but it's something I couldn't help but wonder while sitting through a demonstration of the game last week. "WET is a really stylized Tarantino-flavored acrobatic shooter," said Patrick Fortier, creative director at developer Artificial Mind & Movement. "The vision was to combine shooting, swordplay and acrobatics into one seamless system and create a game with the kind of energy you would find in Desperado or Killbill. "The Crazy 88 scene is the kind of energy we're going for in Wet." 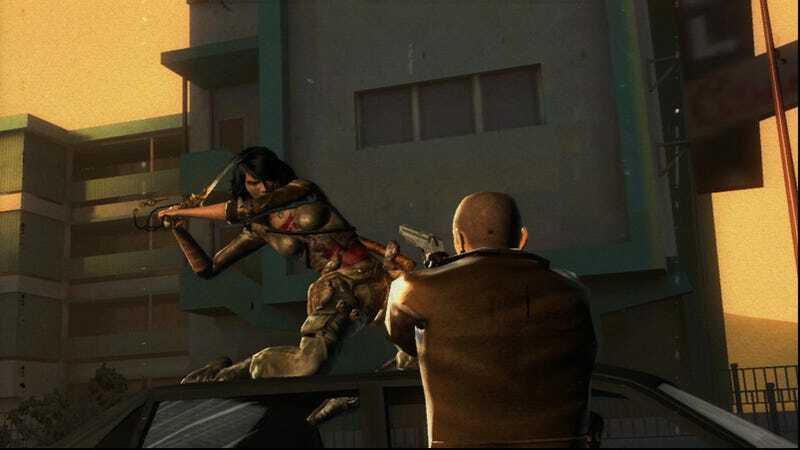 The game's main character is Rubi, a fixer that Fortier described as a sort of contemporary take on Clint Eastwood's character in the man with no name. As in Kill Bill, the female lead is a mysterious character, a women driven by money who gets double crossed and betrayed. The game's style leans on the look and feel of 70s action movies with grainy visuals, a cheesy retro soundtrack and that classic ironic mix of violence and humor. The game's demonstration opens up on a deal gone bad in San Francisco. Rubi hops through a glass ceiling and begins to clear the room. The controls, we're told, are relatively simple. You press A to jump, B to slide, the left trigger to wall run and the right trigger to shoot. Time slows down a little while sliding, wall running or in the air, so you want to do that as much as possible to make clearing the rooms, which always seems packed with enemies, easier. While time is slowed, you use the right thumbstick to aim one of Rubi's guns, the other gun auto aims, making it easier to take down multiple targets at the same time. "The idea is to make it clear for players that they should do acrobatics because you have a second gun and are doing double damage and you have slow mode," Fortier said "These things make you feel that much more powerful and reward you instantly." The whole point of the game is to get players to never stop, never slow down, Fortier says. It's about thinking, shooting, slicing on the run. Players can swing from poles, control the direction of their slides, wall run across people, instead of walls and, most importantly it seems, string together these acrobatic moves to dazzling effect. "We don't want to interrupt a player's flow of combat," he said. "Players create their own lines as they move through the environment. We don't want players to stand still." The acrobatic kills all get nicknames, like 360 dive, killer head rush, double dealer or enemy stomp, and all of those moves feed into the scoring system. The style modifier awards points which can be used to unlock new moves or upgrade weapons. While initially Rubi only has a sword on two pistols, as the game progresses she can unlock dual shotguns, dual machineguns and explosives. While running through a level, acrobatically killing off wave after wave of enemy looked fun, it also looked like it could get a bit old after awhile. Fortunately, the developers made sure to try and mix things up with a few other modes we were shown. There are a sort of boss fights, for instance, that feature what the developers termed "exotic gameplay." The one we saw featured Rubi hopping from car to car on a freeway, running along the sides of buses, flipping onto the hood of cars, as she makes her way to an enemy speeding down the road. It is essentially a glorified dynamic shooting gallery. You don't control the car, and a lot of it is strung together quicktime events, but it looks really cool. Another fun touch is the game's Rage Mode. These sequences, which are activated automatically about seven or eight times throughout the game, turn the already stylized look of WET into an animated snuff flick… in a good way. The one we saw kicked off after a splash of blood spattered across Rubi's face, making her snap apparently. The graphics shift drastically, painting Rubi and her enemies as near silhouettes on a blood-red backdrop. In the mode Rubi is just short of being invulnerable and inflicts a lot more damage. The game also shifts scoring to reward more heavily for chain kills than number of kills. Each of these Rage modes will have their own quirks we were told. WET also has some neat little touches. Rubi regains health by swigging from a bottle of whiskey and then throwing it into the air and shooting it. She uses her sword to pry open doors. And the game's load screens look like 70s intermissions complete with cheesy ads and even a melting bit of projection. The game will also feature something called Rubi Vision, which wasn't shown during the demonstration. It's still being worked on, but we were told that it would label some of the environments, like poles, as interactive. The idea is to make sure players won't have to stop to assess an area and can continue to kill on the run. WET, which is due out for the Xbox 360 and Playstation 3 this fall, features an eight to ten hours singleplayer mode and two or three other modes you can unlock. Those modes include difference race, time and gun challenges that take place in unique settings like her home in an airplane graveyard. There will no longer be a multiplayer mode. WET was initially a Vivendi title, but Activision Blizzard decided to drop the game last summer. And Artificial Mind & Movement bought back the rights to Wet. They later pitched it to Bethesda Softworks which agreed to publish the game.